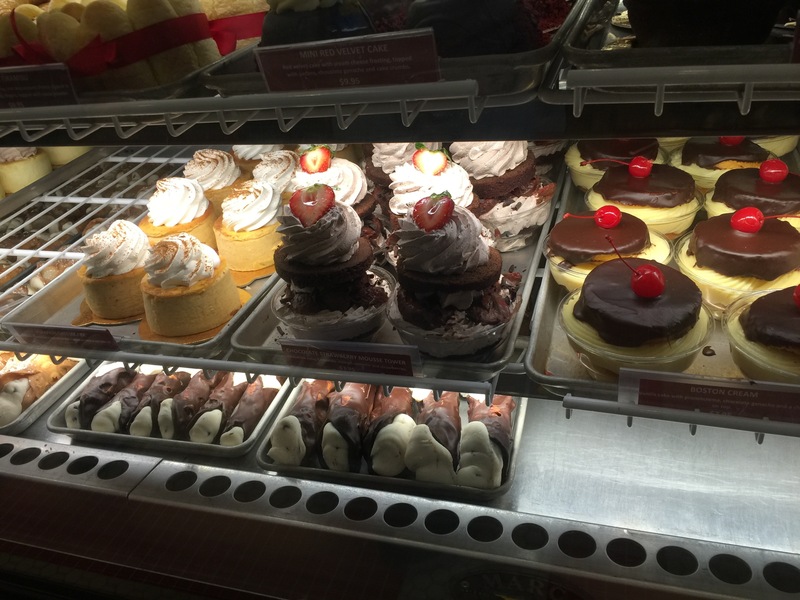 After we had planned our quick weekend trip to Las Vegas, I had mentioned to my husband that there was a bakery at The Venetian that I wanted to pay a visit to. 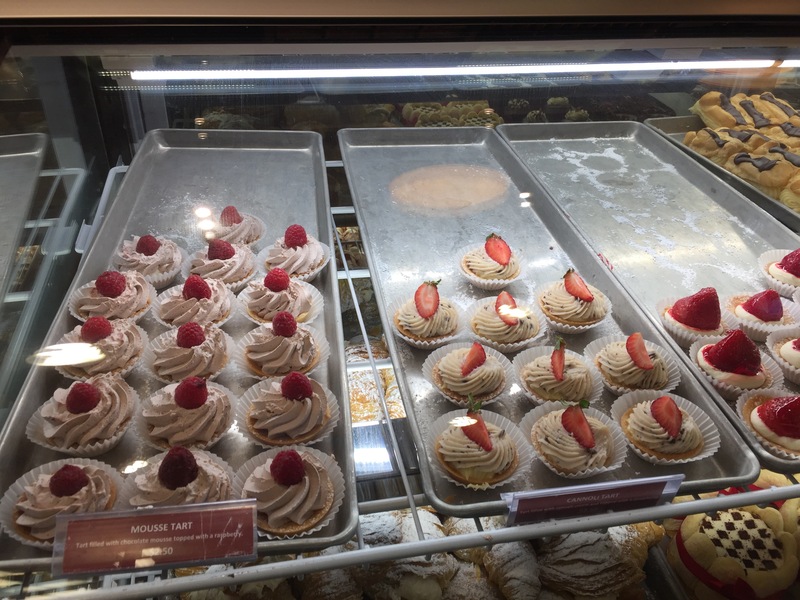 As my husband isn’t nearly as fond of bakeries and pastry shops as I am, he didn’t really care one way or another if we visited the bakery or not. How can one not have a sweet tooth? Any mention of cakes, cupcakes, cookies, baked goods, etc. and my mouth starts to water. Mention the same things to my husband and he has absolutely no reaction at all. I don’t understand it one bit. 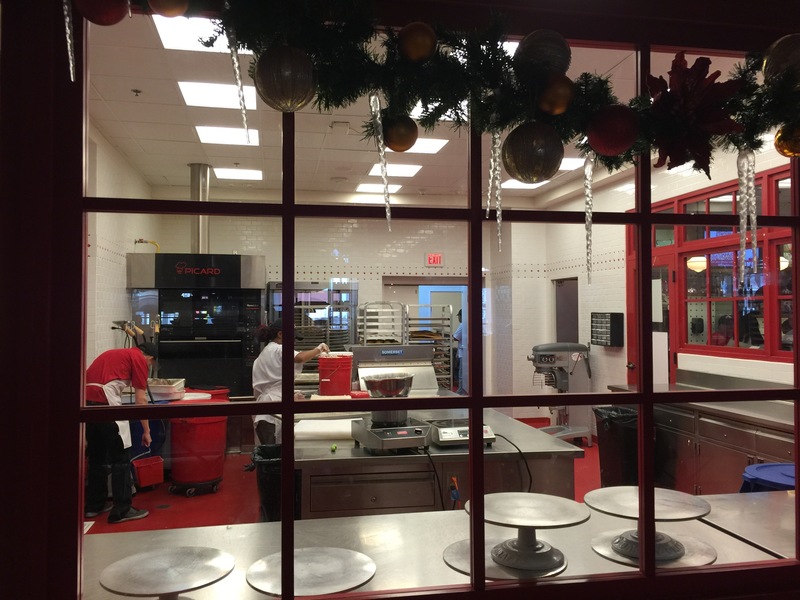 Carlo’s Bake Shop in Las Vegas is owned and operated by Buddy Valastro of “Cake Boss” fame. 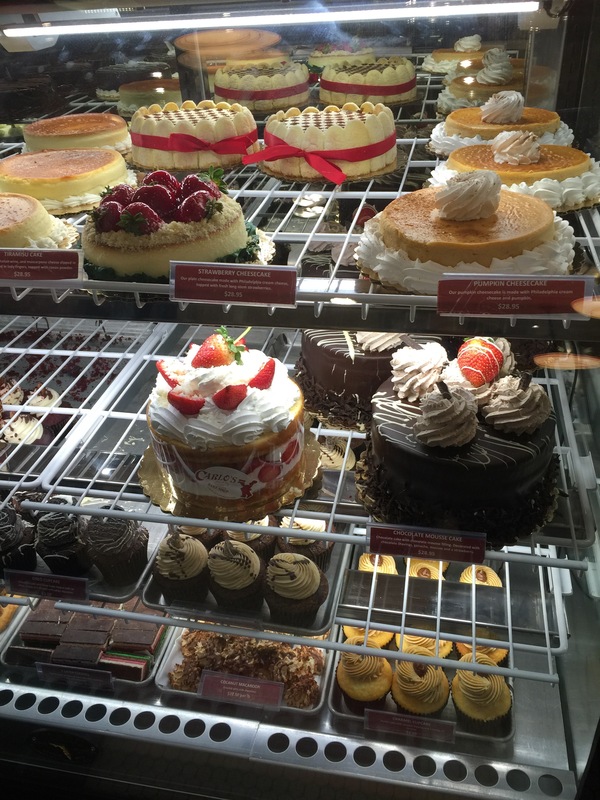 “Cake Boss” is a popular food show on TLC that goes behind-the-scenes of a bakery in Hoboken, New Jersey called Carlo’s Bakery to see how they produce thousands of custom cakes for customers far and wide. Over the years, from the popularity of the show, Buddy’s empire has grown and has now moved to Las Vegas where he has a restaurant and a bakery. I wanted to get my hands on some of their baked goods as traditional Italian pastries are just so hard to pass up. 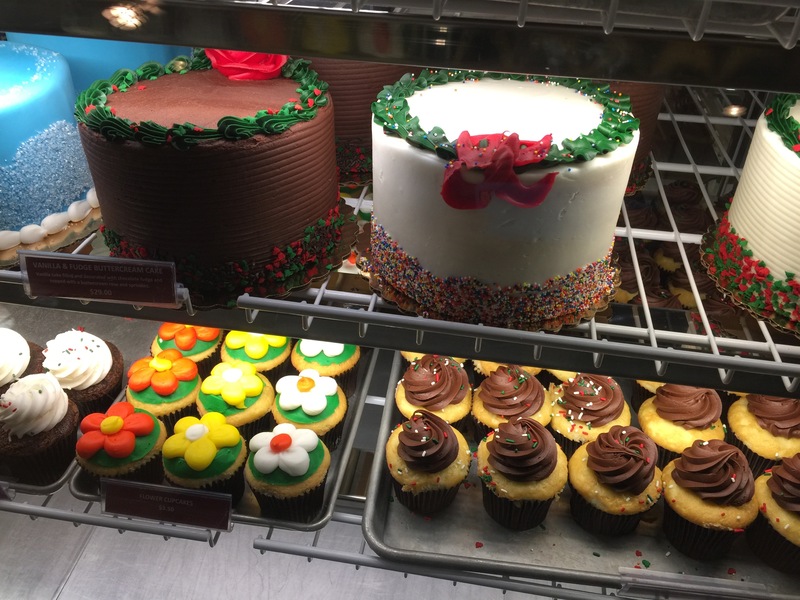 The store is set up with many glass-front display cases where all of the cookies, cupcakes, pastries and cakes are displayed. You can look through the glass and decide what you want to order before you step up to the counter and place or your order, or you can start at the glass counter fronting the store front and follow the counter around pointing to the various items you would like to order as they are boxed up for you behind the counter before you end up at the last glass fronted case right at the cash register. Either way, the selection is so numerous and everything looks so delicious, it’s not a matter of what you want to order, but more a matter of having some self control not to order one of everything that’s displayed. Adjacent to the bake shop where the goods are sold is the actual kitchen where all of the goods are baked and the cakes are decorated. The bakery itself is also glass-fronted so that you can look into it and see all the activity that goes on “behind-the-scenes.” It’s always fun to watch cake decorating and cookie decorating, and considering the many outlandish cakes that Carlo’s Bakery has come up with in the past, I’m sure being able to look into the inner workings of a popular bakery never provides for a dull moment. 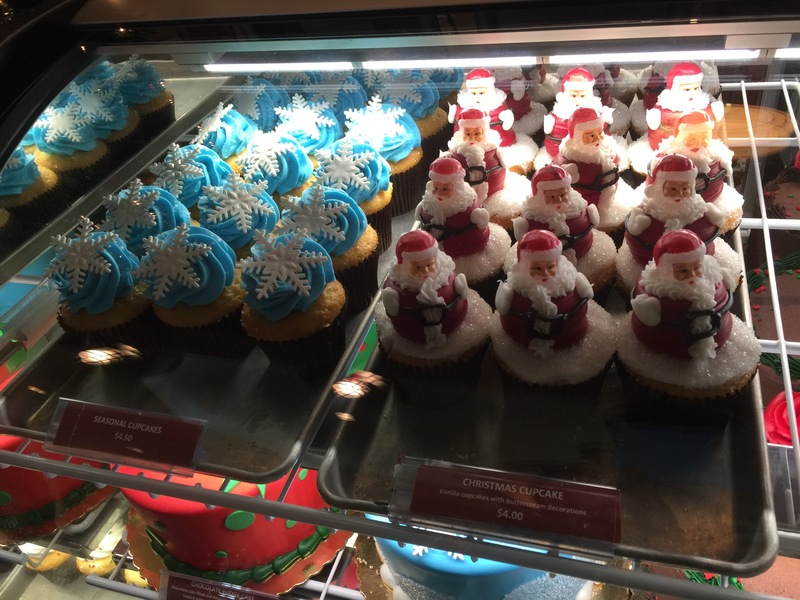 As we were there just before Christmas, there were many Christmas-themed treats. 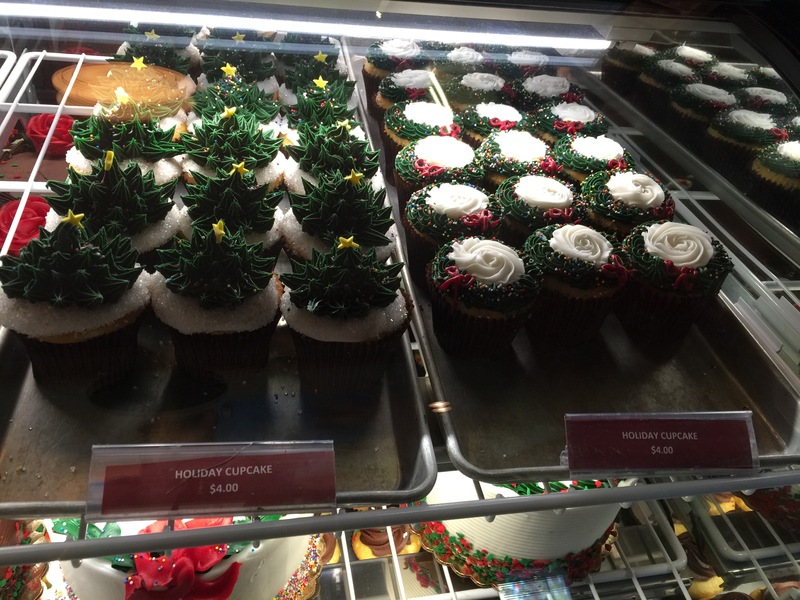 Here are Christmas tree cupcakes and Christmas wreath cupcakes. They look so cute and realistic and detailed. But most importantly, they look so delicious. I’m a huge frosting fan, so the more frosting on the cake or cupcake, the more mouth-watering it is to me. Here is a blue frosting cupcake topped with a sugar snowflake to celebrate winter. Or what about a vanilla cupcake with a buttercream Santa Claus atop it? How can resist something that just looks like so much fun and is perfectly suited for the season? And it’s not just the cupcakes, but there are seasonal themed cakes as well. White buttercream frosting with a confetti base and a cake top decorated like a Christmas wreath. Or the same cake, but with a chocolate buttercream frosting rather than vanilla buttercream. But, if you’re not into the seasonal cupcakes, look below, you’ve got a traditional vanilla cupcake with chocolate frosting, or how about the very colorful spring flower cupcakes with green frosting and a variety of red, white or yellow flowers? 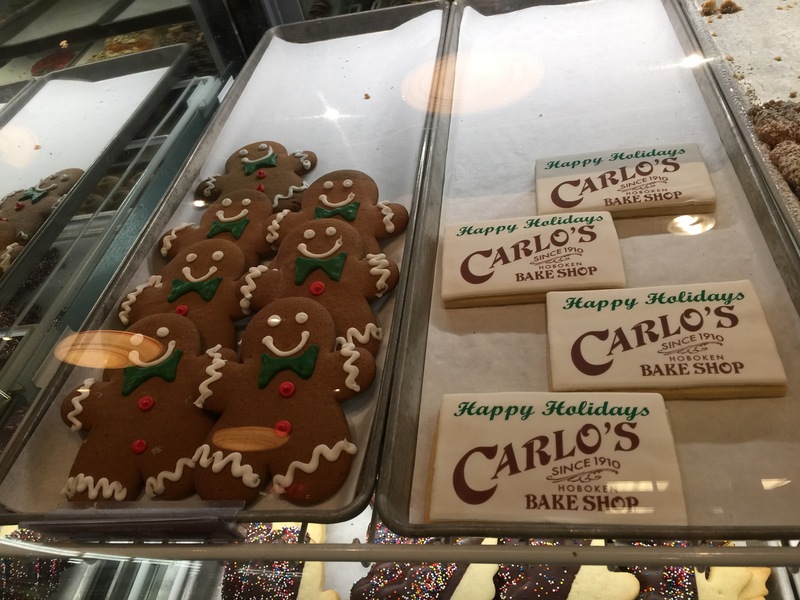 Carlo’s Bake Shop wouldn’t be a traditional Italian bakery without serving up a wide variety of Italian cookies and pastries. 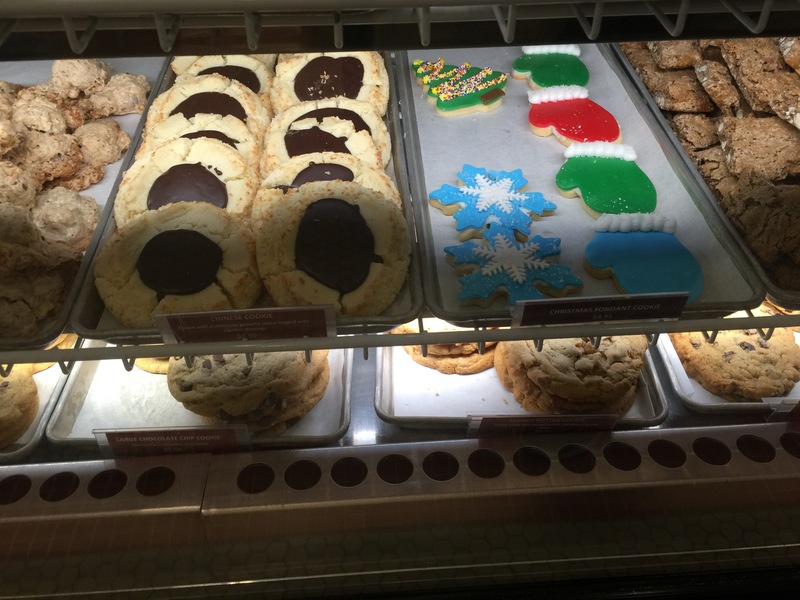 Here’s an entire glass case filled with ruglach, cookies, biscotti and other treats. There were four different flavors of ruglach – apricot, chocolate and cheese, raspberry and chocolate. And there were 6 different types of biscotti – chocolate almond, anisette, chocolate pistachio, vanilla pistachio with cherries, vanilla hazelnut and chocolate hazelnut. Then there were jelly butter cookies, jelly sprinkle cookies and nutella butter cookies. Many people were buying up boxes of cookies and biscotti. What I was really interested in though was the pastries. Look at the delectable Oreo tower or the strawberry shortcake tower. I have a weakness for strawberry shortcake and this shortcake cut in half and filled with fresh whipped cream and fresh strawberries looked almost too good to pass up. But then there was the chocolate strawberry mousse tower or the mini Boston cream cakes. These individual serving cakes looked amazing and each one appealing in its own way. There was even a mini pumpkin cheesecake. And look at the bottom row there, chocolate dipped cannolis! Speaking of cannolis, that is one item that Carlo’s is known for. 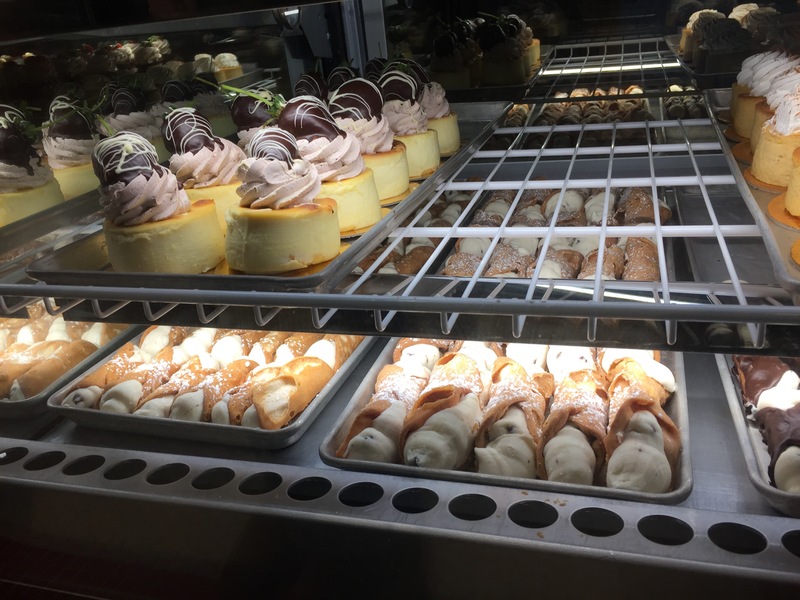 One of the most popular of Italian pastries, Carlo’s Bake Shop was selling mini and regular sized cannolis as well as chocolate dipped cannolis. You could also buy a cannoli tart, which was a tart shell filled with the cannoli cream filling. Or there was a mousse tart if you like the mousse better than the cannoli cream. There were also cream puffs, eclairs and even mini tiramisu cakes. And one of the more popular items were lobster tails, which look amazing and are hard to make. They were a little too large for my appetite though. We’ve got more cookies. 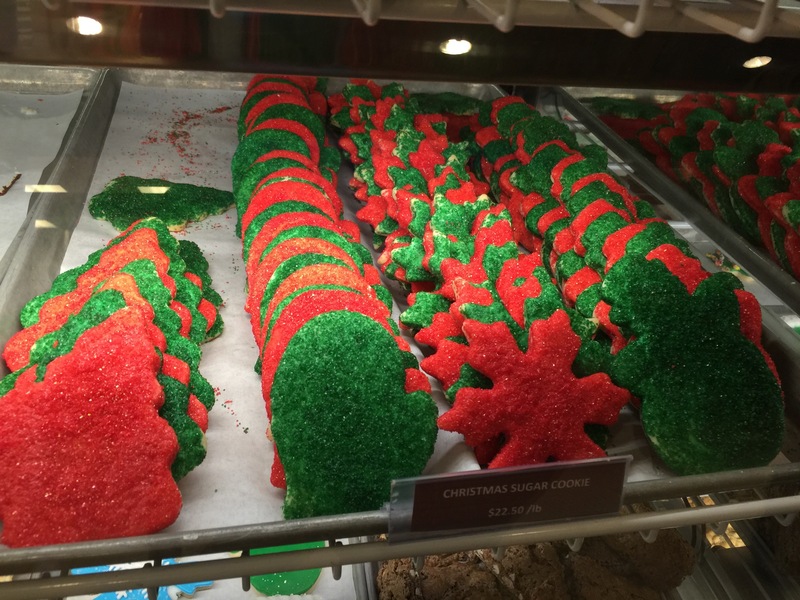 Again, there are seasonal themed Christmas sugar cookies in the shapes of red and green Christmas trees, mittens, snowflakes and snowmen. There are also beautiful fondant cookies with blue and white snowflakes and blue, green and red mittens. Of course, there’s also regular cookies, but in large sizes! There’s the chocolate chip cookie, peanut butter cookie, Chinese cookie, vanilla hazelnut meringue, chocolate walnut meringue and triple chocolate cookies. There’s shortbread cookies dipped in chocolate and sugar cookies with green and red sprinkles. There’s also coffee crumble cake, chocolate hazelnut tarts and croissants. And finally, in case you to buy something to help you remember where you got it from, there’s the frosted Carlo’s Bake Shop sugar cookies with the special Happy Holidays ink on it or how about some jolly gingerbread men? There’s so much to choose from, its hard to make a decision about what you really need vs what you really want. Although, I guess you don’t really need any of this, you just want all of it. 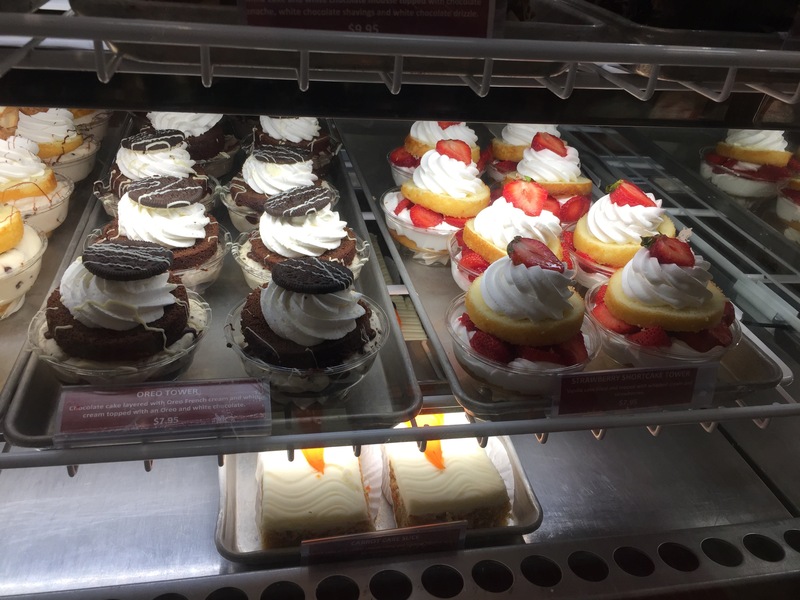 After some back and forth, my husband and I ordered a couple of mini cannolis and I chose the chocolate strawberry mousse cake. 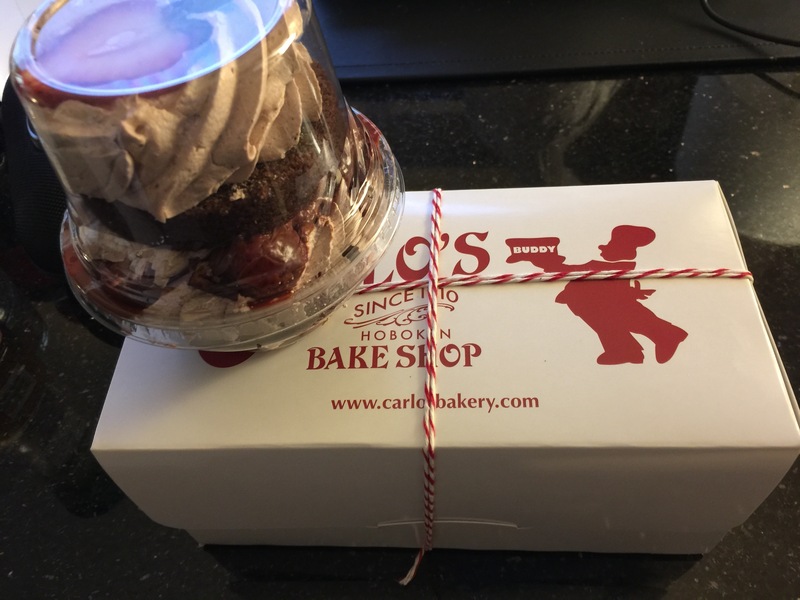 The cannolis were boxed up and wrapped traditionally in twine and the individual cake was put into a cup that preserved the cake so that it didn’t get smushed or damaged in the box as we walked around Las Vegas. The chocolate strawberry mousse cake was delicious. The chocolate mousse was semi-sweet, but not too much. The strawberries were a terrific compliment and why chocolate and strawberry go so well together. The chocolate cake was delicious, and while it was slightly dry and could have been fluffier, it wasn’t so bad and the cake was more mousse than it was cake, so it was fine. The cannolis were delicious, as cannolis always are. Perhaps, not the best cannolis I’ve ever had as I still think that Mike’s Pastry may have the title as the best cannoli, but these weren’t bad. The cannoli shell could have been a little fresher and had more crunch, but it’s so hard to find cannolis at any bakery, I’ll take what I can get. Admittedly, Carlo’s Bake Shop in Las Vegas a little more of a glorified bakery due to its name and reputation rather than an authentic homestyle bakery, but it isn’t bad. 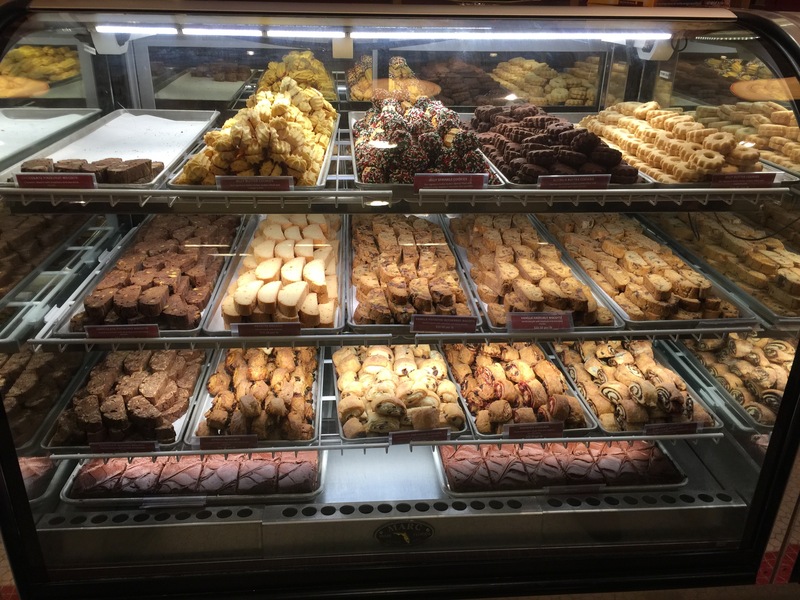 If you hit the Bake Shop when it isn’t so busy and there isn’t a line that wraps around the shop, then it’s definitely worth it to stop in and grab a pastry, or cannoli or two for the road. If there was a line around the shop, as there tends to be due to its reputation, I’d say that you could probably skip the pastries and the higher prices for a croissant and coffee somewhere else. 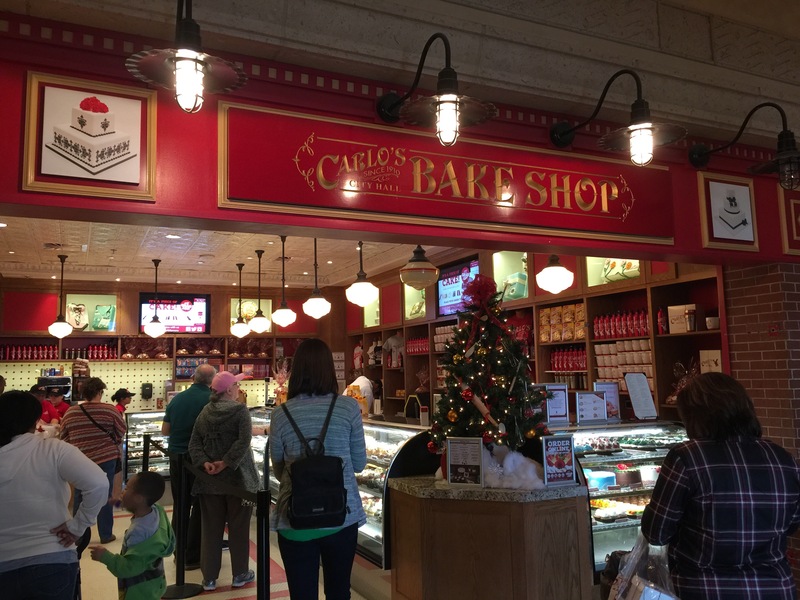 As I’ve watched the show Cake Boss for many seasons, and I happened to be in Las Vegas, I thought it would be fun to stop into Carlo’s Bake Shop to look around and see what it was about, and pick up a couple of pastries. Now that I’ve been here and I’ve tried it, it was fun, but not necessarily something I’d go out of my way to go back to again in the future.